Are you transforming your backyard into an inviting place to entertain family and friends? Let Patio and Spa help. 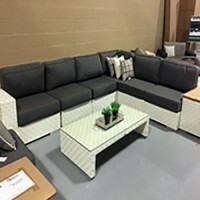 We have a huge selection of elegant outdoor sofas, loveseats, sectionals, dining tables and hot tubs to suit everyone's needs. Our sets are made from a variety of materials including resin wicker, cast aluminum, stainless steel, wood or glass. 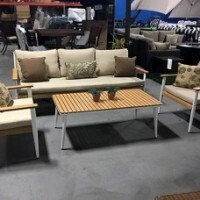 Plus our sets are accompanied with lofty, zippered and poly-filled seat and back cushions made with Sunbrella Fabrics. 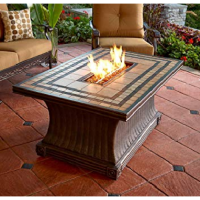 Sunbrella is a world renowned company whose fabrics are water resistant, fade resistant and durable Fire tables are an excellent way to add ambience and warmth to your evenings as well as hot tubs. Patio and Spa carries the Dynasty line of hot tubs. Built to last and designed for comfort, Dynasty spas offers ample room, high performance and a wide variety of jets to ensure true hydrotherapy. Allow Patio and Spa to assist you with all your backyard needs. 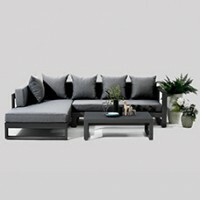 Details:The Miami Sofa Set consists of:1 Sofa2 Club Chairs1 Coffee TableFeatures:Comes w/ Sunbrella .. Details:The White Sectional consists of:1 Sectional1 Club Chairs1 Coffee Table1 End TableFeatures:Co.. Details:Left Arm ChaiseRight Arm SofaCoffee TableFeatures:Made of Premium Aluminum Framing - colour .. Features: Porcelain Tiles Operates on concealed Propane Tank Easy Electronic Ignition w/ Adjust..